A blog about the search for the perfect beer. Ranking and rating beers until perfection is found. Beer Rankings and Beer Reviews across all Beer Styles from 3 different beer reviewers. 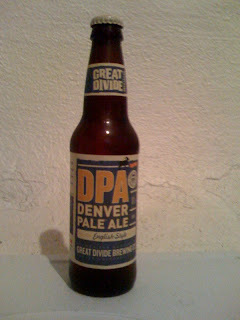 Denver Pale Ale, Great Divide Brewing Co., Denver Co.
One of the newest releases in the World Tour series is Otter's Dubbel, a Belgian Ale in the traditional dubbel style. 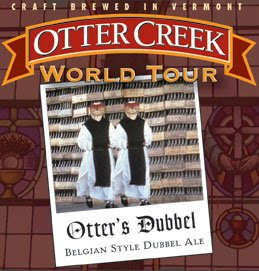 For the benefit of the Internet, I tracked down and purchased a 22 oz bottle of Otter's Dubbel for $2.99. Sadly, this beer is a huge disappointment. It is also somewhat hard to find, which could be a good thing for the rest of you. First, the beer tasted and smelled like sour fruit, like cherries or raisins, which is not uncommon for a Belgian style beer. But it seemed like the fruit was spoiled or something, as it was a flavor disaster. Really not at all good. Then, there is an overpowering taste of caramel or dark brown sugar, as if the brewers were trying to drown out the fruit with sweetness. It didn't work, and the end result is like a visit to the dumpster behind the grocery store where they throw the rotten fruit. To make it worse, the beer seemed to be a bit light in the alcohol department. ABV is not published, but I'd guess that it is below 6%. I had to pour out the last few ounces, and throughout the entire beer, I was thinking of something to chase the taste of this one out of my mouth. Like an onion. And a quick intro - I'm very open minded with my beers, and I'll try anything once. Unlike some other reviewers, I believe that beer glasses were created to enhance the flavor of the beer. Something like Corona is appropriate from the bottle, but a Duvel or a Sam Adams is better in the right glass. The Corona. We've all had one, we've all had a lot more than one. When I was a kid, nothing said summer like that first day I got to wear shorts to school and the familiar sound of the ice cream truck trolling the neighborhood for customers. That all changed when I discovered the wonders of beer. Whether you enjoy it with the lime (or lemon or orange as I've also seen), or a la carte, nothing beats a Corona on a warm summer's eve. It goes down smooth, with little after taste lingering in your mouth. If you choose to go with the lime, it gives it that added zip that it doesn't necessarily need (in my opinion) but that definitely makes it taste more like summer. It may not be the most perfectly crafted beer, but we've all had those days where we come home from a long day at work on a hot August afternoon, and a Corona or two out by the grill makes all of life's little problems disappear for those few hours. It's inexpensive, great for a party, and still trying to fight its way out of the summer beer stereotype. I have to admit that on those mostly dark days of mid winter, a nice cold Corona can momentarily take me back to the beaches in Mexico. On a side note, a friend once left a sixer outside one frigid winters night. The fridge was full, so his deck was the next best thing. We brought it in, popped the top off the bottle and put in a lime. Within seconds, from the bottom up, the beer crystallized. Now I'm no scientitian, so I have no idea why it did this, but something about the chemistry of the lime interacting with the beer, caused it to turn to slush. I highly recommend you try this some night. Overall, it's generally light on flavor as well as in color, but something about it keeps us coming back. I'm going to rate it a solid 3, but some of that has to do with the summer feelings that come along with it. Quickly, I'd like to introduce myself. As you can tell from my nom de plume, Pale Ale Guy, I'm a fan of the pale ales. I tend to stay away from the porters and stouts, but that won't stop me from trying some this winter. I'm a laid back kinda guy, who enjoys long walks on the beach.. wait wrong bio... The plan is for the first few entries to review the beers of summer. I'm going with the lime flavors first, and we'll play it by ear after that. If you have any suggestions, I'm always open to hear them. Now on Facebook. Don't worry Non-Facebookers, all new content will go through the site first. It's a bit humbling to learn that something you have been doing your entire life is completely and utterly wrong. I learned that Sunday when my dad got me my first father's day gift. For years I have been getting him every tie, golf gadget or polo shirt imaginable. His gift to me? A six pack of Narraganset beer, and it was the 16 oz. cans. It was a subtle message, definitely old school. 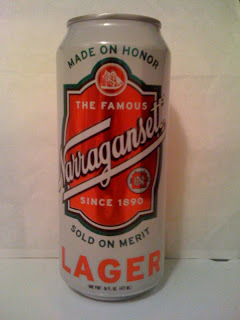 Narragansett Lager is your father's beer, the new white cans emblazoned with the mottoes "Made on Honor" and "Sold on Merit" is definitely an old school marketing approach. The beer is just like the mass produced beers. It starts with a harsh malt taste, but then instead of finishing bitterly, it just trails off, not entirely smooth, but not entirely not not smooth. Get my drift? OK, so the 'Gansett isn't a top of the heap kind of beer, but compared to the other mass produced beers it's a good choice. I mean 16 oz cans and 5% ABV are good things, right? OK Beer Crusade 3.0 launches now. What's different? How about 2 new writers? The Knight of Saint Arnold (Saint Arnold being the patron saint of beer) and Pale Ale Guy will bring their taste buds and their preferences for Stouts and Belgians. They've promised to review the beers I have stayed away from and to challenge the beers I've reviewed in the past. We're not only gonna focus on the microbrews but mainstream beers will be reviewed as well. We'll hit beer festivals, breweries and brew houses. We'll rate the seasonals and special batches. And we'll try review the best and worst beers out there so you know what you are getting into. The Third Crusade starts now.